On March 14, 1887, the worst accident in Massachusetts railroad history occurred at West Roxbury. At least 37 people were killed, with many people seriously hurt. The Boston & Providence Railroad 7:00 am train to Boston was made up at Dedham with nine passenger cars and one baggage car. The train picked up more passengers at Roslindale, and headed north as usual. Just south of Forest Hills Station, the engine, tender, and two passenger cars made it across the Bussey Bridge at South Street. "I was sitting in the rear seat of the third [passenger] car, the first thing I noticed was the derailment of the front end of the car, this was one-third of the way across the bridge; I was facing the window, talking to a young lady, in less than six seconds the rear end of the car seemed to sink and the heads of the passengers in the front appeared at least six feet higher than our own. Then came a violent shock that tore away the flooring. The front platform of the car was carried forward and struck the abutment. The rear end of the car also struck the abutment with great force...."
"Over the body of one young girl who was dead, the police were bending, endeavoring to ascertain her name or where she belonged. There was nothing about her to indicate who or what she was, except that she probably was a store girl, for in her hand she still held a bag that contained her luncheon. Her head and body were terribly bruised, and it was evident she was killed instantly. A young man whose leg was completely crushed lay beside her, and while some were bending over him, endeavoring to soothe his suffering until the arrival of the physicians he opened his eyes, and seeing the young girl, he begged those about him to turn their attention to her; that he was strong and could wait until she had been cared for. He was not, however, as strong as he supposed he was, and [was] soon swooned away. He was, however, strong enough to know how to be brave." The bridge was built at a slanted angle to the street below. Iron trusses were built across the span. Semi-perpendicular I-beams supported the track, and were suspended from these trusses by iron hangers. The hangers resembled large cotter pins looped at both ends. Some of the hangers were inaccessible for inspection, and had rusted completely through. The primary structural reason for the collapse was the failure of the hangers. The bridge was originally constructed of wood, and then an iron truss was added on one side. In 1876, the bridge was rebuilt and the older iron truss was moved to the other side, replacing the wooden span. A 2nd iron truss was added, making an iron pair. The designers of the bridge were not civil engineers. Manufacturers of the iron components were not supervised. Contractors that built and/or repaired the bridge were never supervised. The Boston & Providence Railroad officials initially agreed that rusted hangers had caused the accident, but then the company backed off from its responsibility. Theories were put forth that the derailing of cars had caused the bridge to fail, and that part of a brake system had snagged in the bridge which splintered it. Also noteworthy, it was a miracle that the wooden coaches did not ignite into an inferno, and burn the trapped passengers to death. Wood stoves in the passenger cars were locked shut, preventing embers from escaping. The engineer of the doomed train sped forward into Forest Hills Station, jumped off the train, and pulled an alarm to get fire companies to the scene quickly. Some of the good that arose from this tragic event is that all railroads in Massachusetts were soon required to inspect all bridges by a competent engineer once every two years. 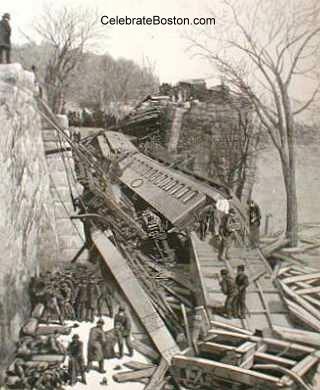 Just one month earlier in February 1887, the worst train wreck in Vermont history occurred at Hartford.